Watermelon salad, you say? Sounds interesting right?! I have to admit the name threw me off at first. For me, watermelon is to be enjoyed at a picnic table on a hot summer day, preferably with cold watermelon juice dribbling down my chin. But listen, I have found a new refreshing way to enjoy watermelon that will not only make you feel extra fancy- it will also satisfy your sweet and salty cravings. This recipe is sure to be a new favorite of yours because it’s simple (3 ingredients), it’s healthy, and it tastes great! 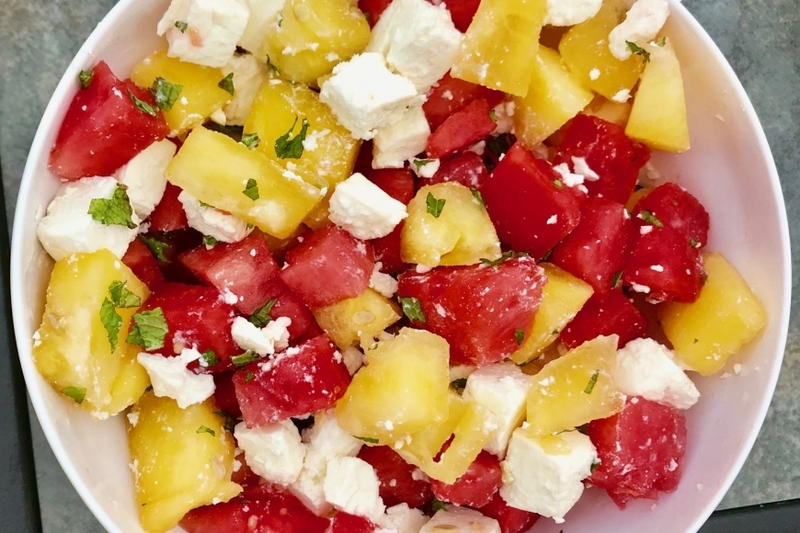 Combine these three ingredients in a bowl and enjoy immediately for a refreshing blast of summery flavor! This recipe is a great base and you can personalize it any way you like. I know people that add arugula, lemon, tabasco, cucumber, tomato, or even switch it up with goat cheese. Keep this recipe in mind if you need to bring a dish to your next outdoor gathering and it’ll be the talk of the party! **side note: Did you know that watermelon also comes in a yellow color? I sure didn’t! That was quite a surprise for me when I sliced one open! It tastes like red watermelon, maybe just a touch sweeter. If you’re like me, and happen to accidentally purchase a yellow watermelon instead of red; don’t fret! I used it in the salad and I think it gave the dish a nice pop of color.